*T*****ime is a prison. She is the key. Packed with danger, temptation and desire - a perfect read for fans of The Red Queen. I wasn't particularly sure that I was going to enjoy the book from the first couple of chapters. However, once I had settled in to it I thoroughly enjoyed every second of it. Although, it must be said right up front that Jules is a very frustrating character and I did spend a lot of time tutting and mentally shaking my finger at her as she continued to make silly assumptions and not see what was right in front of her face. Don't you hate it when characters do dumb things! The world building here is exceptionally good and it is not just the blood-iron coins and how the whole upper classes rely on "stealing" time from the lower (although this has been meticulously thought through) but the actual places in this world are rich and real. Although, they do have a sort of Sherwoodesque Medieval feel to them this is nto necessarily a bad thing. At the very least it means that we are in a fantasy world that looks and functions much as ours does, this makes it easier to slip in to the story without pesky details about what would seem anomalous features yanking us back out. The basic tale here is of Jules and her attempts to earn some blood coin to save her father having to donate his last time to keep a roof over their heads. Unfortunately this means a return to Everless, where she was brought up and from where her and her father where exiled. Backed in to a corner Jules has no choice but to try and become a servant at Everless now The Queen is coming to visit for the celebration of her ward to one of the Gerling Princes of Everless. A Gerling Prince that Jules knows all too well. The plot itself moves along at a good pace and is full of quirky little details and odd little coincidences that point the reader in the direction of the truth whilst leaving the characters themselves in the metaphotical dark. I was quite pleased to have guessed at most of the major plot points before their big reveal but it may have been more fun to find them out with Jules. I did have a great deal of fun reading this book though and I am looking forward to Evermore being released. We follow Jules Ember, a 17-year old girl who lives in the kingdom Sempera where time litteraly is money, where the rich live for ages and the poor struggle trying to earn enough time to stay alive and pay their bills. 10 years after being banished from Everless, the estate of the rich Gerling family, she returns in order to earn enough time to save her father. Ignoring all her fathers warnings and pleadings not go, she starts a journey that reveals a past and a truth she never expected. Reading the synopsis the first thing that comes to my mind is the similarity with the movie "In time", but actually this story is nothing alike. It takes place in a different era where battles are still man to man fights, transport depends on horse carriages, (rumors of) sorcerers and witches still exist and alchemists succeeded in binding "life time" drawn from the blood to metal. We get the inside of life at the Gerlings' estate from bottom to top, discovering it's secrets trough Jules eyes. But more important we get to know more of her past as she remembers it, the real reason why she and her father were banished al those years ago and why her father didn't want her to return to Everless. I just flew though this book, not able to put it away. I admit it was predictable, but not of the kind that made me sigh or ruin the whole plot for me. To me it was what a good YA-book should be. Easy written and a balance between adventure, tension, friendship, the struggles of life and in this case topped with fantasy. 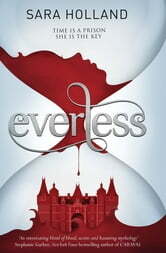 Sara Holland's debut YA novel Everless is about seventeen year old Jules, who in order to care for her sickly father, becomes a servant at the Everless palace, home to the rich and powerful Gerling family and a place she has sworn to never return to. From the synopsis, it seems Everless is your typical YA fantasy. A young girl, who struggles to survive day by day and look after her family (or what's left of it), moves to the palace in hopes of a better life but discovers much more than that and becomes embroiled in something bigger than she could have ever imagined. Things aren't what they seem and danger, secrets and romance ensue. 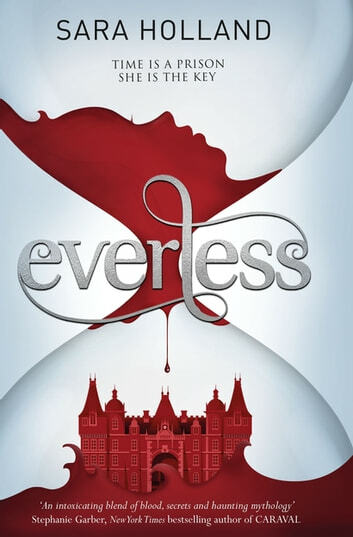 Although it does seem that way, Everless is a YA fantasy which though does not surprise, still manages to engage the reader. It depicts the inevitable cliches well and revolves around the refreshing concept of blood as time and currency. The characters are written with depth and felt real, but I would have liked even more development of them besides the main character, Jules. However, this meant that her character was easy to understand and relate to which is important in the book. The pacing is very good - there was never a slow patch and the climax at the end quickened the pace a lot. To be fair, I did find myself skimming or skipping some of the descriptions at times, but that was because I felt that I already had a picture of Jules' world in my mind. The novel overall is quite light on the fantasy but it does set up nicely for the sequel, which should have more developments on the magical aspects. In terms of plot twists and suspense, this novel doesn't really have much of either. However, it did a good job in making me feel like there was always something going on and that I had to read more to find out. It also manages to drop hints towards the big reveal, which made it fun to guess. This did mean I saw some of the connections coming but fortunately not all. If you're someone who is not big on romance or fears it will overshadow other aspects, I am glad to say this book doesn't do that. If you read the synopsis it does mention romance, but it's not a major part of the story. The novel focuses mainly on Jules and the things she uncovers about herself and her past. If you read to the end, you do realise why the romance is needed and how it plays into something much bigger. The novel sets up the romantic relationship that will develop in the next book. Overall, I am very satisfied with Everless, and especially the world it has introduced me to. I was particularly fascinated by the idea of blood that could be turned into coins and then consumed to lengthen one's life. I would highly recommend this novel as the writing is lovely and flows well, and I haven't been this excited about a novel for a long time.